HomeCryptocurrencyCrypto NewsWhat is this EOS? The project, initiated by the EOS.io company in June of last year, will conclude on 28 June 2018. Dan Larimer, founder of Steem and Bitshare, said that the new block project EOS would be much more scalable and faster than Ethereum. EOS, which uses Network Bandwidth to share the block chain, may be more efficient for users of decentralized applications. Another indicator of how generous the ICO is when 90% of the coins are distributed to investors. These two parts are separated by 20% in the first part and 70% in the second part. BitShares has introduced a concept of horizontal scalability that allows processing speeds of up to 100,000 at the moment. Steem Platform is trying to solve the problem of transaction costs by providing a tool that users can interact with without any fee. Dan Larimer claims that for each EOS project within each project, he solves a fundamental problem that impedes widespread commercial scale use of block chain applications. 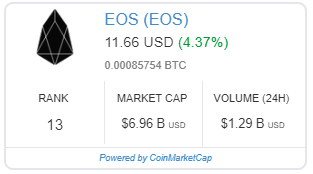 At present, the market value of the EOS, which is at $ 11.64, is about $ 7 billion and there is a 24-hour volume of $ 1.3 billion.